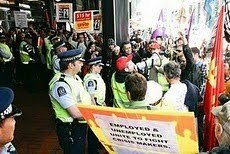 A united front has been formed to fight the new government's anti-worker 90 Day 'fire at will ' legislation. Waitemata branch fully supports this campaign. Below is a lealet we have been distributing at WINZ offices. The anger of the working class is evident: last week our leafletting gained six recruits in two days. WE WON’T PAY FOR THEIR CRISIS! Worldwide workers are being laid off en mass as the capitalist crisis deepens and intensifies. In one day TNCs have laid off 70,000 workers. Workers are losing their homes and families are breaking up as they are being made to pay for a crisis created by the system that never enriched anyone but the bosses. 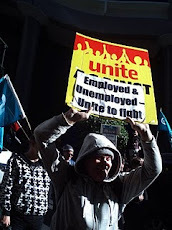 In Aotearoa 7% unemployment is predicted, with 20% for Maori. A third of employers have announced their intention to lay off staff in the next three months. On behalf of the bosses the Key government is taking advantage of this by making it easier for employers to fire workers. 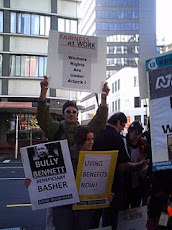 And, as if the already unemployed were individually responsible for their situation, WINZ is requiring them to engage in the futility of visiting three employers per day! What can the individual do? NOTHING! But it is because it has been proved time and again that united and organised in unions the working class are a mighty force, bosses governments have conspired within our lifetimes to smash the union movement. The limited protection offered to unions by the recent Labour government resulted in slow union growth and modest wage gains. 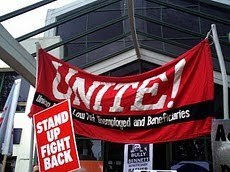 It is now up to workers own efforts to rebuild vital democratic fighting unions with full membership rights to the unemployed. In USA and elsewhere workers are occupying factories to prevent their closure. Communities are uniting to resist evictions. Mass demonstrations are forcing the resignation of government ministers. 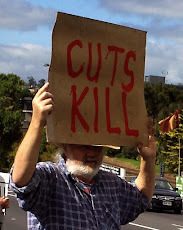 In Auckland Feb 28th is to be Day of Action Against the 90 Day Bill. Form committees in your workplace, send delegates to planning meetings. While our backs are against the wall! 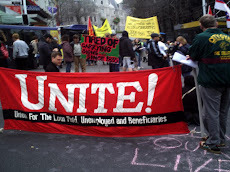 Unite is the union for unemployed, and Waitemata Branch is planning collective actions to prevent the unemployed being victimised by the crisis. 100% effectiveness will require 100% participation of the unemployed. We are as yet far from achieving that, so join up and lend your weight to the struggle. Poverty is Government's Shame, Not Ours!